What with the economy going pear-shaped and all, it seems prudent to develop a second (or third) potential income stream… just in case. Now with How Old Are You? 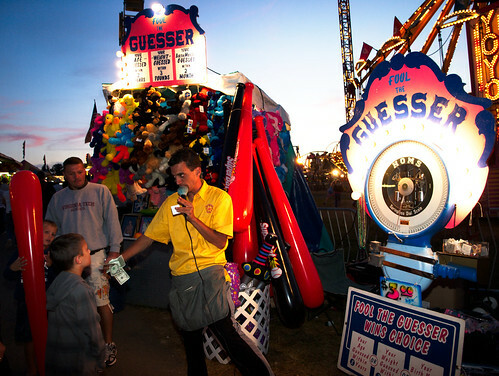 readers can practice the skills they’ll need to pull down a packet on the Midway. 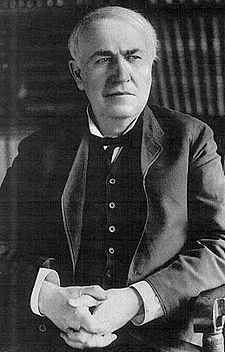 As we consider simply inventing a way out of this mess, we might plug in an extra lamp for Thomas Alva Edison, born on this date in 1847. Edison may have been the greatest– or at least, the most productive– inventor in modern times. He earned patents for over a thousand inventions, some of which profoundly changed the trajectory of life in the Twentieth Century– e.g., the incandescent electric lamp, the phonograph, and the motion-picture projector. He improved upon the original design of the stock ticker, the telegraph, and Alexander Graham Bell’s telephone. He created the world’s first industrial research laboratory. And he was a pioneer in copyrighting films and in clustering patents into Trusts that then rigorously (some suggested, ruthlessly) enforced their intellectual property rights. This lattermost achievement notwithstanding, Edison was not above a bit of piracy himself: in 1902, agents of Edison bribed a theater owner in London for a copy of “A Trip to the Moon” by Georges Méliès (known to film buffs and pre-blog readers of these missives). Edison then made hundreds of copies and showed them in New York City– for which Méliès received no compensation. Méliès had been counting on recapturing the huge cost of his pioneering animation by showing it throughout the US… a plan preempted by Edison. Méliès was bankrupted.